Continuing Stage 3’s science investigations into made environments and information. The students will evaluate these videos by making dot points on a PMI (Plus, Minus, Interesting) scaffold. 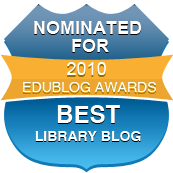 I have been invited to present at the 2012 MANTLE Conference in June, speaking on two topics: “Engaging students through Guided Inquiry” and “How to promote your school library on a shoestring budget”. Both topics will have some added tweaks to presentations I’ve done before, so I’m really looking forward to the challenge of the conference, and meeting teacher librarians of the Newcastle, Maitland, Taree, Lake Macquarie and Central Coast districts. On Monday, I was fortunate and honoured to be the keynote speaker at a New England Region teacher-librarians’ professional learning day at Westdale Public School in Tamworth. 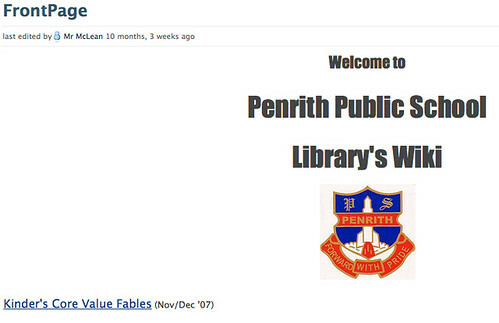 My brief was to present “School library makeovers on a shoestring budget – and Adventures in Web 2.0”. It was great to meet host TL Zoe Morris and all the TL attendees, but many thanks to Patrick Sullivan (aka sullypm) for introducing us to his Breakkie with a Teckkie page, which both promotes the Web 2.0 video conference series for NSW DEC teachers, and has hyperlinks to a huge range of amazing Web 2.0 tools. I’ve just registered our school for the National Year of Reading. Australian libraries are supporting the campaign to turn 2012 into the National Year of Reading, linking together all the great things that are already happening around books, reading and literacy, and giving them an extra boost, with inspirational programs and events taking place across the country. The website at www.love2read.org.au/ is already quite extensive and will continue to grow. There is also a wiki at https://love2read2012.wikispaces.com/ for resources and templates the committee has made available already. I’m happy to report that Fearless, the British bulldog toy who visited our school last year, has arrived at his next destination, . We look forward to read of his new adventures. My fifth day each week (timetabled in chunks across the rest of my four TL days) is to work with students on PSP (Priority Schools Program) literacy and numeracy projects. This term, it’s Kindergarten’s turn, and we’ve been part of the “Travelling Fearless Project”, in which Fearless, the misnamed, cowardly, British bulldog puppy from the Colin Thompson & Sarah Davis picture book, is visiting various schools, coordinated by Cath Keane at School Libraries & Information Literacy. I hope to provide annotations, and the results of our pre- and post-tests, on a parallel page to our wiki work soon: Select the third option on the menu. Enjoy! I’m off tomorrow to a teacher-librarians’ seminar on “Guided Inquiry”, presented by Dr Ross J Todd! Teacher-librarian Lee FitzGerald, a former editor of “Scan”, is also presenting and last time I heard of her experiences trialling “Guided Inquiry” under Ross’s guidance, I went back to my school and made a point of recording more often student pre-test and post-test results and tracking the emotional side of my students’ self-evaluations, thus gaining very solid statements of the students’ analyses of their learning, in their own words. Powerful stuff! 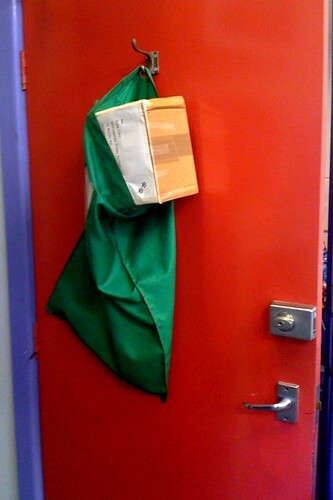 The Kinder students who were part of a wiki project in 2007 still talk about those experiences to this day, and the Stage 3 students who did a bushrangers WebQuest in 2008, and recorded their learning on a blog, are being represented in a text book very soon! Both of those successes occurred without the benefit of now seemingly-indispensable elements such as IWBs and the Connected Classroom. Looking forward to tackling the next stage! 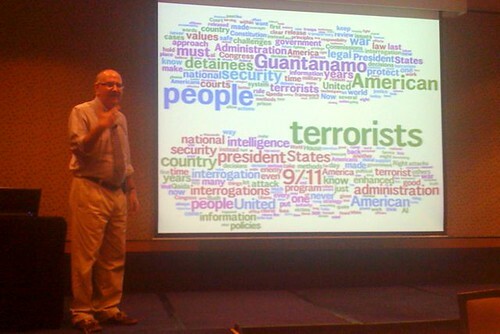 Obama and Cheney… as Wordles! Taking a break from stocktaking for a moment, I wanted to share some digital stories my Early Stage 1 bloggers made over the last few days. These Kinder students, plus a K-2 Language Support class, have continued coming to the library for their regular PSP literacy sessions – what to do now the book rap is over?! – and we’ve been able to extend their Term 4 class learning about fables. 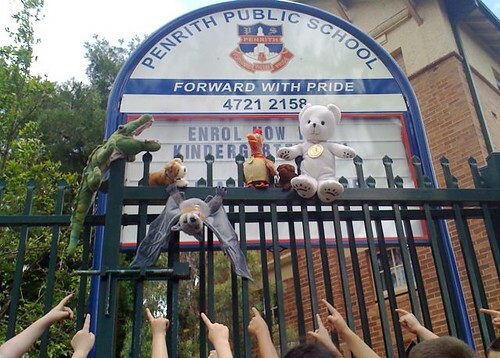 They have enjoyed incorporating ideas from Stage 2’s digital stories, which were support material during the recent Bear and Chook books rap. As you will see from the two Powerpoints, first we read many versions of each Aesop’s fable, then spent time in the playground with mud-map storyboards, the library toy collection, some hastily-made props, and my trusty iPhone. After I uploaded the photos into Keynote (Mac) templates at home, I converted them to Powerpoint format and brought them back to school on a memory stick. The students then viewed their photos again on the IWB, and then we jointly constructed new text during Circle Time (talking & listening). 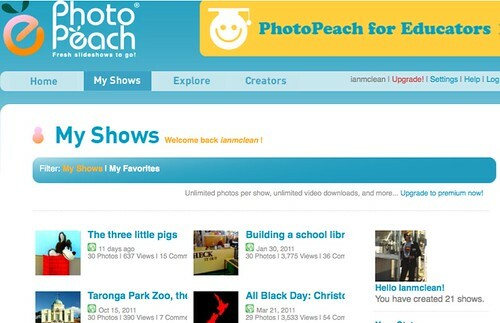 Then some editing after feedback from other audiences – and uploaded to our school blog site. The hare & the tortoise. This is my third consecutive year working with Early Stage 1 students on fables. 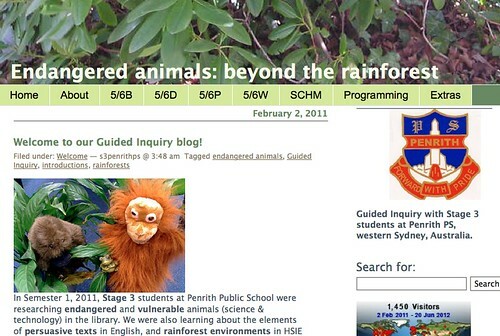 The students who created our first batch on a wiki in 2007 (at penrithpslibrary.pbworks.com still talk about them!